In 2014 when Black Friday was introduced here in the UK H Samuel decided to offer its customers buy 1 get 1 half price on everything. We are now expecting the same or better each year from now on. The H Samuel Black Friday sale will allow you to save a lot more money for a few days. The jeweller sells many items including earrings, engagement / wedding rings, watches and so much more at affordable prices. But for a few days starting on Black Friday, prices will be even lower overall. Like in 2014 the discount showed in the H Samuel shopping basket, and normally on this event day they do not include charity items or repairs within its BF UK deals. There are now 303 H Samuel stores in the UK now, you will be able to walk into a store and see some great offers. But if online shopping is better for you then just bookmark this page and please join our BFUK Facebook and Twitter pages for notifications of when the deals go live. Black Friday deals will show here if/when they go live > H Samuel. I am hopeing they will be offering the same deal as they did in 2016 – Buy One Get One Half Price on EVERYTHING. MY wife is going to be so happy, H Samuel is offering 3 for 2 on all Chamilia Disney items and i have got 3 of them..
H Samuel online is offering up to 50% off watches as well as £15 off when your spend £75. Back in 2016 H Samuel done a great Black Friday Buy One Get One Half Price on EVERYTHING deal, so hope they are going to do the same this year. You can get an extra 10% off all H Samuel half price Christmas favourites. Last year in 2015 H Samuel were offering buy one get one half price on everything, is this year going to be the same or different? Velentine’s Day 2016 is here next week, and thanks to the H Samuel up to 50% off sale you can save a few pounds. You can save £50 on the stunning Evoke Rose Gold Plated and Crystal Heart Set, the price was £99.99, bit now only £49.99. Visit H Samuel and search product code 4015029. Save £200 on the Seiko Solar Men’s Chronograph Stainless Steel Bracelet Watch, it was £399.99 but now only £199.99. For a limited time only you can get 20% off all diamonds at H Samuel. Other deals include 50% off watches as well as 50% off many other products such as Seksy etc. This is amazing, i am going to propose to my girlfriend and i had my eye on the 18ct Yellow Gold 1.5 Carat Diamond Solitaire Ring but it was priced at £6599, but thanks to a £1600 saving it is now only £4999. 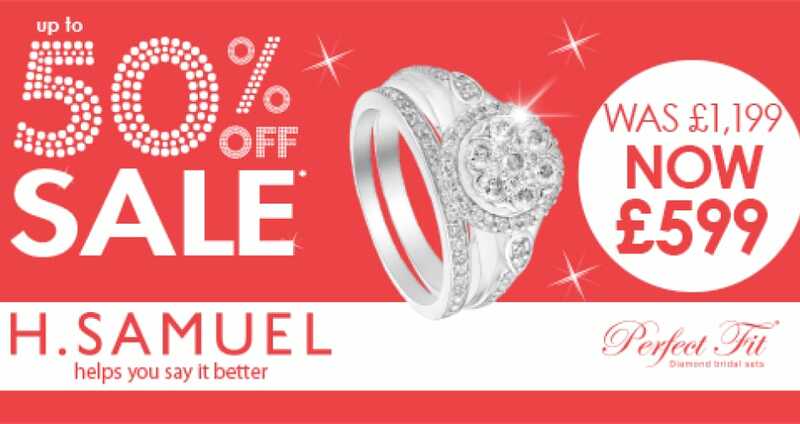 Loving the fact they already have a 50% off watches sale going on right now, as well as 50% off diamond rings and much more. I just saved a whopping £400 on a 9ct half carat white gold diamond cluster ring. Price was £799 reduced to just £399 but now wished i waited for the Black Friday sales. You can save £125 on the Citizen Eco Drive men’s watch, is there any chance i can get this cheaper than the marked price of £124.00 on Black Friday? Do you think H Samuel will offer a better deal than buy 1 get 1 half price. It would be much better this year to buy 1 get 1 free when spending £200 or more, or 30% off everything.